The DP63000 Series provides the user the ultimate in flexibility, from its complete user programming to the optional setpoint control and communication capability. The DP63000-TC accepts a thermocouple input. The DP63000-RTD accepts an RTD input and both provide a temperature display in Celcius or Farenheit. 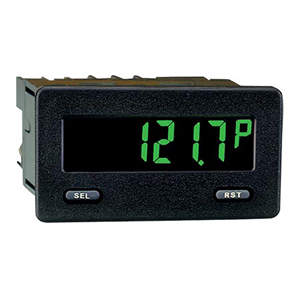 The meter also features minimum and maximum display capture, display offset, °F or °C indicator, and programmable user input. The display can be toggled either manually or automatically between the selected displays. Other models include process, DC voltage or current input signal and provides a display in the desired unit of measure. The DP63000 Series display has 12.2 mm (0.48") H digits. The LCD model is available in 2 versions, reflective and red/green backlight. Note: The reflective display models have been discontinued due to low sales but some stock may still be available. The backlight version is user selectable for the desired color and also has variable display intensity. The capability of the DP63000 can be easily expanded with the addition of option modules. Setpoint capability is field-installable with the addition of the setpoint output modules. Serial communications capability for RS232 or RS485 is added with a serial option module. The DP63000 can be powered from an optional power supply that attaches directly to the back of a DP63000. The power supply is powered from 85 to 250 Vac and provides up to 400 mA to drive the unit and sensors. Note: Adding option cards—meters can be fitted with up to 2 optional plug-in card, however, only 1 card from each function type can be installed at a time. The function types include setpoint alarms and communications. The cards can be installed initially or at a later date. Each optional plug-in card is shipped with installation and programming instructions. * Software is a free; download from www.omega.com.